Join us for our 4th Annual “Quarter Kraze” on Saturday, April 13th at the Morris American Legion. 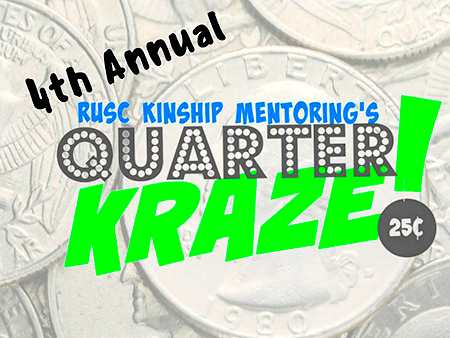 Quarter Kraze is a quarter raffle fundraising event to benefit our local youth mentoring program. To participate in the raffle you must purchase a paddle (like at an auction) with a corresponding numbered chip. Paddles can be purchased at the door for $5 or in advance for only $4 by contacting us. This is a chance to win items for as little as a quarter! Vendors will be present from 2:00 p.m. to 5:30 p.m. and the the Raffle will take place from 3:00 p.m. to 5:00 pm. Sweet treats and beverages will be available for a donation. Don’t miss our “Quarter Kraze” Event Saturday, April 13th at the Morris American Legion. For more information about the event contact us or see our Facebook page. © 2019 RUSC Kinship Mentoring.